DOZENS of protesters have occupied a third Dublin property as they continue their fight to highlight Ireland's housing crisis. 'Take Back the City' is a network of 18 grassroots activist groups who are "working together to take direct action" against property owners across the capital. At least 100 people gathered on O'Connell Street in the city centre at 5.30pm this evening and marched towards a vacant property in Belvedere Court. The property has now been occupied with banners and posters hanging from the windows. Last week, the same group of activists defied a High Court order to continue the occupation of 34 North Frederick Street. On Tuesday, Mr Justice Michael Quinn granted Patricia Ní Greil, the owner of the property, injunctions requiring persons unknown to vacate and cease trespassing at the four-storey building. However, dozens of people remain at the property and are refusing to leave. In an affidavit posted on the door of the house, Mr Colm McGreal, the father of the owner, said they intend to transform the property into a guest house. Toady's occupation is the third of its kind. 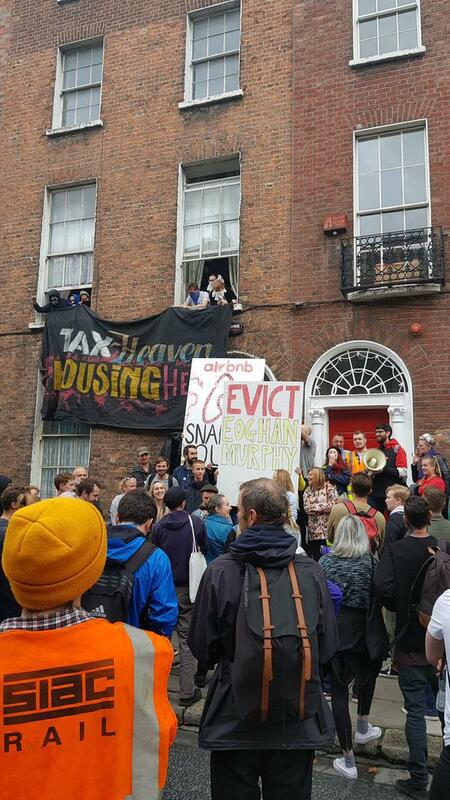 Activists took over a property in Dublin’s Summerhill Parade in early August in response to the eviction of up to 120 tenants with only 48 hours notice. They were told they had to leave a number of houses on Summerhill Parade in May for "fire safety reasons". The properties are owned by Pat O'Donnell & Co Ltd Retirement and Death Benefit Plan, the trustees of which are PJ O'Donnell and Peter McLornan, who were granted a High Court injunction to have the property vacated. Activists then turned their attention to 34 Frederick St, which has no connection to the Summerhill properties. Organisers of the protests say they want: "To continue to highlight the causes of this housing crisis, one of which is land hoarding and speculation by private owners." A spokesperson for the network said "public representatives aren't beyond targeting" when asked about why they are now occupying the house in Belvedere Court.